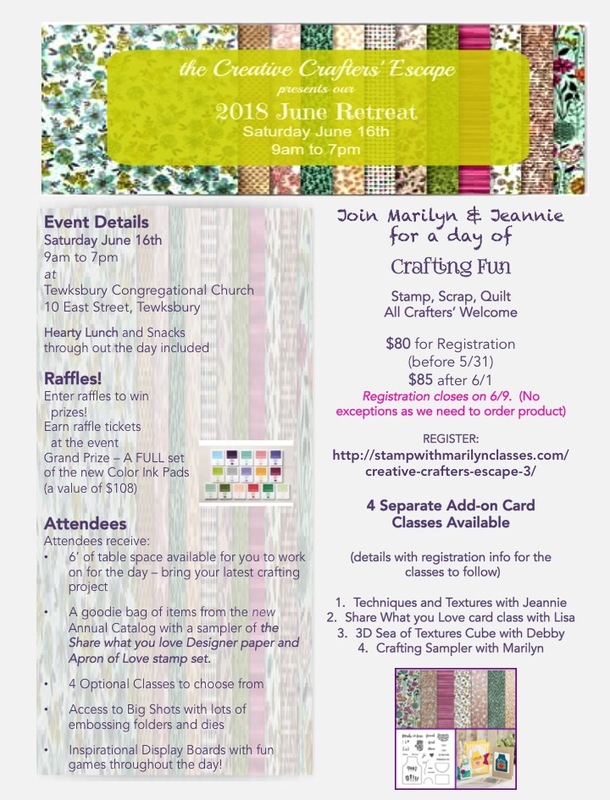 Marilyn SanClemente May 30, 2018 May 30, 2018 3D Item, All Occasion cards, Creative Crafter's Escape, Creative Retreat, day retreats, Stampin' Up! How can it be only 2 1/2 weeks from our next Creative Crafters’ Escape on Saturday June 16th?? Time just flies too fast! So I wanted to share a couple of points with you for the day. My team and I have been very busy planning for another fantastic and Fun day!! We do need to close registration 5 days before the event so we have time to order all the supplies. So registration is closing on Sunday the 10th. Registration is $80 but only until May 31st which is tomorrow! After this, registration goes up to $85! So CLICK HERE to Register for our Event now before Registration goes up to $85! We have created 4 fantastic new classes for the day. You are sure to learn something new! Learn 5 different Stamping Techniques – a separate technique for each card! 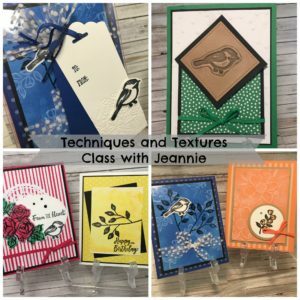 You are sure to learn something new and will have some of the new paper to play with after the class! Class Cost is $30. 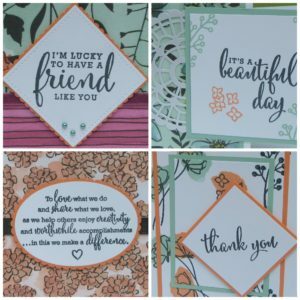 Complete 4 beautiful cards – perfect for any occasion! 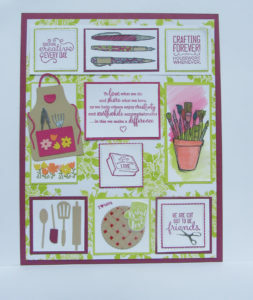 Receive a Full Step-by-step Tutorial for 6 cards with this gorgeous Designer paper! All I can say about this box is WOW!! Wait until you see it! This box is absolutely gorgeous! 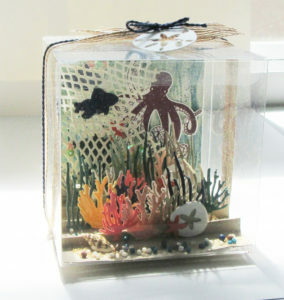 Sea of Textures Stamp set. Your friends will be awed by this project! A Perfect gift for a Crafty Friend or Family member! So are you ready to register for the classes?? We are so looking forward to the day!! Memorial Day Special – Today Only! the New 2018-2019 Catalog is HERE!